Gen. Martin Dempsey, the chief of the Pentagon’s Joint Chiefs of Staff, told a congressional committee Wednesday that US troops may be sent into Syria to fight alongside so-called rebels who are seeking the overthrow of the Damascus government of President Bashar al-Assad. “If the commander on the ground approaches either me or the secretary of defense and believes that the introduction of special operations forces to accompany Iraqis or the new Syrian forces … if we believe that’s necessary to achieve our objectives, we will make that recommendation,” Dempsey told the House Appropriations Committee’s defense panel. There is a growing sense that, six months after President Barack Obama announced the new US war in both Iraq and Syria, this intervention has reached a turning point that threatens to unleash yet another massive bloodletting on the peoples of the region. In Iraq, this threat is imminent with the mounting of a major siege of the city of Tikrit, the former hometown of Iraqi leader Saddam Hussein, who was toppled by the US invasion of 2003 and executed by hanging under the American occupation. Some 30,000 troops—reportedly two thirds of which are comprised of Iraqi Shia militias operating with Iranian support—have sought to encircle the predominantly Sunni city, which lies approximately 100 miles north of Baghdad on the Tigris River. The siege is preparation for an even bigger onslaught against Iraq’s second city, Mosul. Roughly 30,000 civilians have reportedly fled Tikrit in fear for their lives, while tens of thousands more remain trapped in the face of mounting artillery bombardment. Shia militia leaders, meanwhile, have openly proclaimed that the assault will be the occasion for revenge for massacres carried out by ISIS. The US military has stayed out of the Tikrit siege, claiming that the regime in Baghdad had not asked for its aid. In reality, Washington has ruled out any direct military collaboration with Iran, which itself is still a potential target for US intervention. US officials have warned Iran and the Shia-dominated government of Iraqi Prime Minister Haider al-Abadi not to fuel sectarianism. “That would tear at the fabric of the country, and weaken the ability of the Iraqis to confront this threat to their country,” declared White House spokesman Josh Earnest. What hypocrisy! 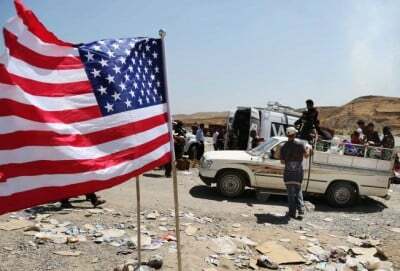 The sectarian tensions are the direct product of the US war and occupation, which killed over a million Iraqis, tore the county’s social fabric to shreds and provoked internecine conflicts as part of a deliberate tactic of divide and rule. ISIS, the purported target of the US intervention, is a Frankenstein’s monster spawned by both the Iraq intervention and US imperialism’s promotion of a war for regime change in neighboring Syria, where it and other Sunni Islamist militias received funding, arms and logistical support from Washington’s regional allies, all under the guiding hand of the CIA. Washington’s stated policy of fostering, arming and training so-called moderate rebels to both combat ISIS and serve as a proxy force in the war to topple the Assad regime has become an increasingly criminal and cynical operation. Last weekend, the last of the ostensible Syrian “moderates,” whose members were armed, equipped and even paid by the CIA—the Hazm, or “steadfastness” movement—officially disbanded after being routed in the northern province of Aleppo by the Al-Nusra front, Al Qaeda’s affiliate in Syria. Advanced US weapons, including TOW missiles, were all surrendered to Al Nusra, while many of the surviving Hazm members joined it. In the wake of this debacle, there are indications that Washington is preparing to seal a pact with Al Nusra, effectively allying with Al Qaeda itself in opposition to ISIS, a split-off from Al Qaeda. The government of Qatar, a key source of funding for Al Nusra, has reportedly been pressuring the group to drop its formal affiliation with Al Qaeda to facilitate this shift. The sheer cynicism with which the military-intelligence apparatus and its front man, Barack Obama, wage their “war on terror” found the clearest expression in statements made by Director of National Intelligence James Clapper at the Council on Foreign Relations earlier this week. Of course US imperialism has operated for more than a decade in the Middle East—from Iraq, to Libya to Syria—in naked contempt for the bedrock provisions of international law, which, since the Nazis were tried at Nuremberg, has banned aggressive war as an instrument for pursuing state interests. What Clapper is referring to is the international prohibition against arming Al Qaeda, a provision that can be evaded by having Al Nusra drop its formal affiliation. Anyone attempting to deduce the logic of US policy in the Middle East from the claims made by US officials runs into a mind-boggling maze of contradictions. In Iraq, Washington is effectively in alliance with Iran and Shia sectarian militias to defeat ISIS. In Syria, it is forging ties to Sunni Islamist militias to supposedly fight both ISIS and topple the Syrian government, which is backed by Iran. Nearly 14 years into the “war on terror,” the US military-intelligence apparatus is preparing to turn an affiliate of Al Qaeda into its frontline “anti-terror” and “pro-democracy” fighters. To the extent that any coherent policy emerges, it is one of stoking the fires of war and political instability everywhere, promoting a struggle of each against all with the aim of weakening every country and government so as to facilitate the US drive to assert its hegemony over the energy-rich region. In turn, this regional policy is directed toward the preparation of even more horrific wars against the allies of Damascus—Iran and Russia. For the people of the Middle East, this translates into another deadly and tragic phase in their drawn-out encounter with US imperialism. For American working people, this policy—developed behind their backs, with no real debate, much less popular support—also holds the threat of catastrophe.